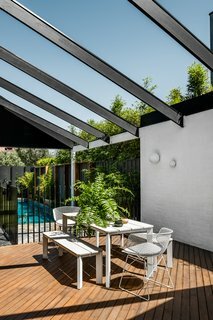 Drawing from Palm Springs modernism and featuring local materials, Northcote House outside Melbourne offers comfort and privacy for the whole family. 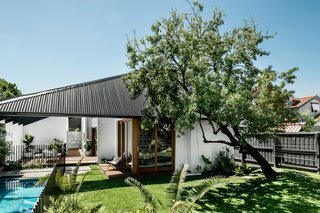 When Nest Architects was tasked with creating a home for a family of five in Melbourne’s Northcote suburb, it was clear it wouldn’t be "another cold, two-story, glassy timber box." The property is situated on a leafy street, originally populated with a mix of Victorian double-fronted cottages, modern marvels, and California bungalows. In fact, project architect Jacqueline O’Brien explains the property originally boasted a bungalow that was too restricting, forcing the team to start from scratch. 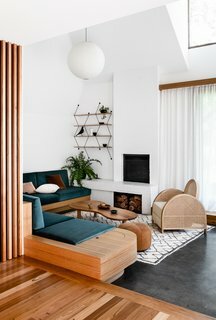 Australian firm Nest Architects drew inspiration from Palm Springs minimalism, California-style bungalows, and Australia's Queenslander homes. 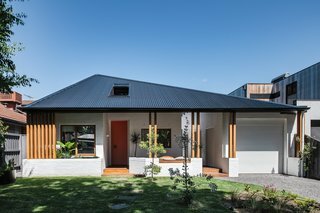 "The clients approached the new build idea tentatively, not wanting to detract from the charming character of their streetscape," she says. 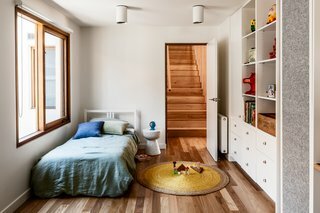 For a space that paired nicely with the rest of the neighborhood, the architects drew inspiration from their clients’ childhood homes and favorite vacation spots. Palm Springs minimalism, California-style bungalows, and Australia’s popular Queenslander buildings deftly joined together to create a warm, inviting home. 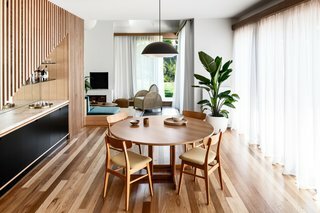 A compact dining room acts as a focal point of the home, with easy access to the living room and pool. A house cannot become a home without its residences, and the Northcote house places family first. Spanning two floors, the 2,900-square-foot home is livable and inviting for a dynamic, evolving family. "Key to this home is an intricate floor plan premised on familial relationships," O’Brien says. "Partner to partner, parents to children, siblings to one another, and the family to their community and neighbors." 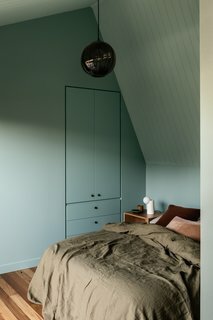 For the Northcote house, versatility is key. A retractable divider can easily turn one room into two. The master bedroom on the top floor creates a private oasis for the parents to retreat to after a long day with a generous, private balcony attached. Downstairs lies another private bedroom and two additional spaces with a divider, so the children can have their privacy when they’re teenagers. 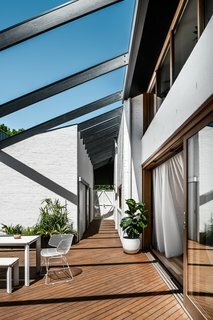 An outdoor decked corridor hugs the perimeter of the home, becoming a standout feature of the property and a subtle way for the parents to keep an eye on their three kids. 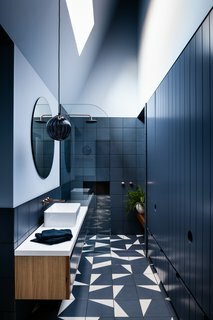 But while the space draws inspiration from the California coast, the architects brought the project back to Australia with locally sourced materials. Vaulted ceilings and a built-in sofa turn the living room into a soothing sanctuary. "The basis of a good house, [which] stands the test of time for us, is a simple palette contingent on the use of good-quality, robust materials," O’Brien says. "When you have that neutrality and softness, the home becomes a backdrop that allows all the other items and furnishings to speak." 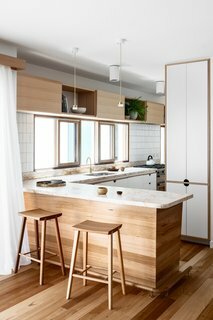 The timber floor is recycled local hardwood Victorian Ash, where the tones vary from butter yellow to soft pink, while the caramel-tinted marble in the kitchen and dining room is local to Queensland. Rounding out the home are pieces from local design stores like Pop and Scott as well as Douglas and Bec. A galley-style kitchen is tucked away at the side of the house, but accessible from the main living areas. Though the house is designed to suit the family’s ever-changing needs, it also welcomes guests with open arms. Many Australian homes focus on the backyard, but the property’s design encourages guests to come in through the back door and experience the home as if they lived there. "It doesn’t turn its back to the street, but invites neighbors and friends in," O’Brien shares. "The single point of this home isn’t a showpiece for the clients to retreat and play house. This house is rambling and inviting and welcomes a connection to the street and their backyard equally." "The importance of this outdoor connection was a very high priority for the clients," O'Brien explains. "They wanted the boys to be free, but wanted to keep an eye on them without them feeling like they’re being monitored." 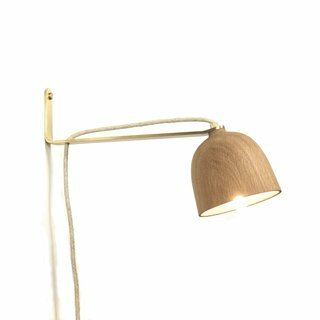 This singular sculpture of a piece exudes the elegance and statuesque grace of it’s namesake, all while quietly suggesting a captivating celebration of the beauty of wood. 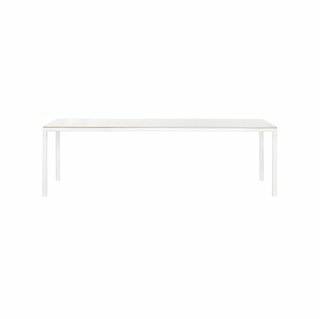 The stunning grain on the piece is a result of a careful and deliberate turned wood fabrication. 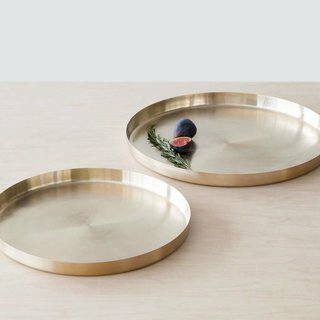 Add a hint of luxe to cocktail hour with these bronze serving trays. Handcrafted from food-safe bronze, these pieces are the perfect canvas for appetizers. A sunny, California aesthetic shines brightly in the outdoor patio. Happy hour has never looked so good. 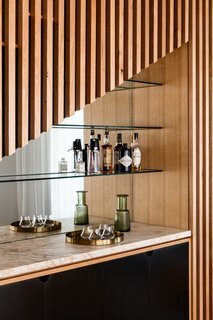 The home's wet bar receives stylish treatment with an asymmetrical facade and mirrored background. 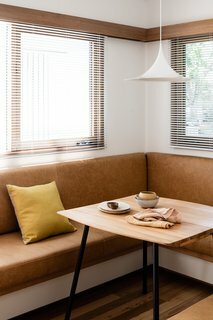 A cozy breakfast nook at the front of the house gets a glimmer of soft morning light. The suburban home sticks to a neutral, soothing color palette, but experiments with prints and textures. Cozy and warm, the main bedroom generously opens up to a private balcony on the north side.